There isn’t much French sailing legend Loïck Peyron hasn’t done in his career. Winner of the Jules Verne Trophy, America’s Cup helmsman, and winner of multiple Atlantic races, his CV and charismatic persona has made him one of the most sought after sailors of the last few decades. 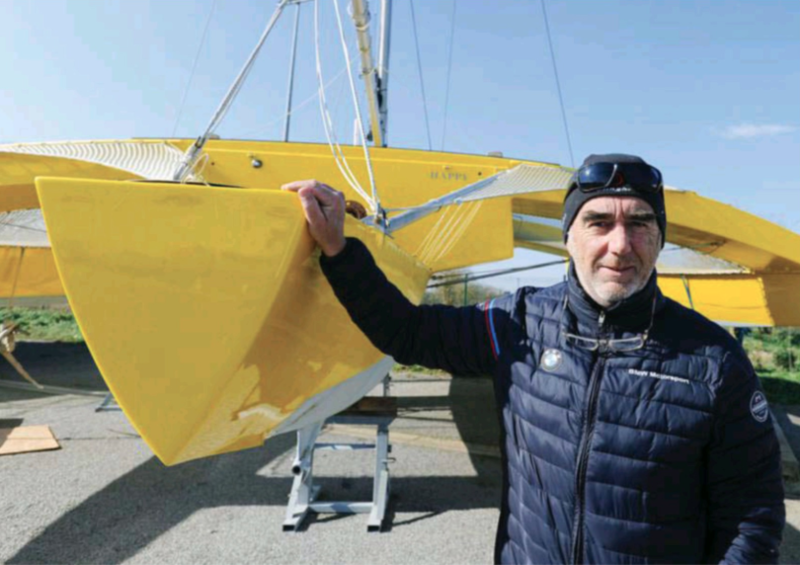 In November last year, he completed the 3,542-nautical mile Route du Rhum-Destination Guadeloupe Guadeloupe solo transatlantic race at the helm of the bright yellow Happy, a sistership of the small trimaran sailed by Canadian yachtsman Mike Birch when he won the inaugural Route du Rhum in 1978. At the finish line, Peyron declared his attentions have now turned to the new Figaro Bénéteau 3. Why come back only for the first of the new boats? So you ordered a Figaro 3? “I am putting this in place. This is the reason why I went to try the boat last week in Vendée. And frankly, it’s really good, it’s great. In particular, the foils. Between them, they weigh 60kg but they replace the 400kg of ballasts Figaro 2. Between No.2 and No.3, it is incomparable. Except in the cinema, the n°3, like the Tuches, or even Stars Wars, are rarely better than the n°1. Do you have a goal for your results? “Already, I do not know if other “old people” like me will return in 2019 but it would be good. I hope I’m not the only one to have that desire. Now, we will have to train. I remember that for the first year of Figaro 2, as much as I had been on the street during the first stage, the following stages, I had finished in the ten, or even in the top five.